Today my friend gave me the Charlean Extreme Workout set, I’m pretty psyched about using it. I already did the first workout today and I’m already feeling it in my arms. I love it! I’m hoping to tone up and lose a little muffin top before winter sets in and I have to start all over again. Those darn Christmas cookies get me every time. Have you used her workout? I’m curious as to what you think, if you did. For those who are not familiar with the workout, it focuses more on muscles than fat because having muscles you burn more calories at rest then you do with cardio. For me, I like strength training over cardio. I am not a runner, dancer or a cardio person. I wish I was, but I’m not. 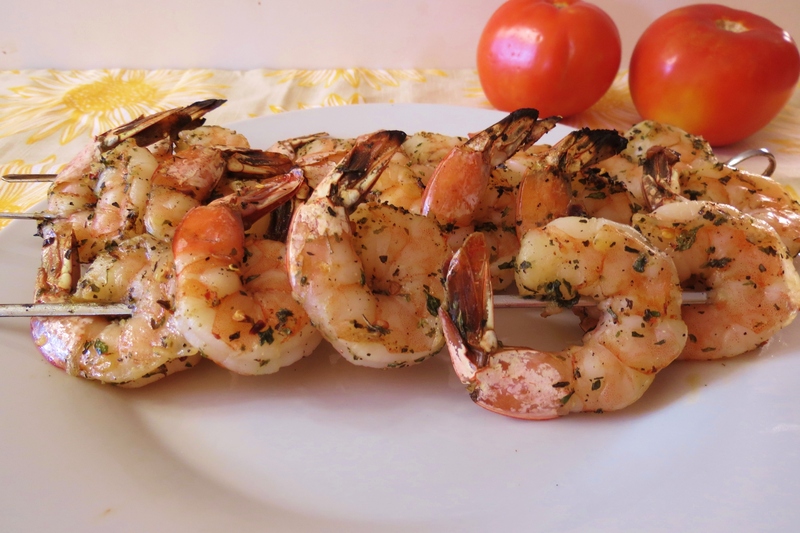 For today’s recipe I have for you my Italian Grilled Shrimp Kabob’s. Are they Kabob’s or Kababs? Not sure? I’ve seen it posted both ways. But either way there easy and delicious! I first want to apologize for pictures. There are some different changes with them. My new computer shows them brighter than my old, plus I felt rushed to take them because my Husband was sitting at the table waiting for his dinner. Nothing worse than serving cold dinner, but I seem to do that more often. Sorry Honey! 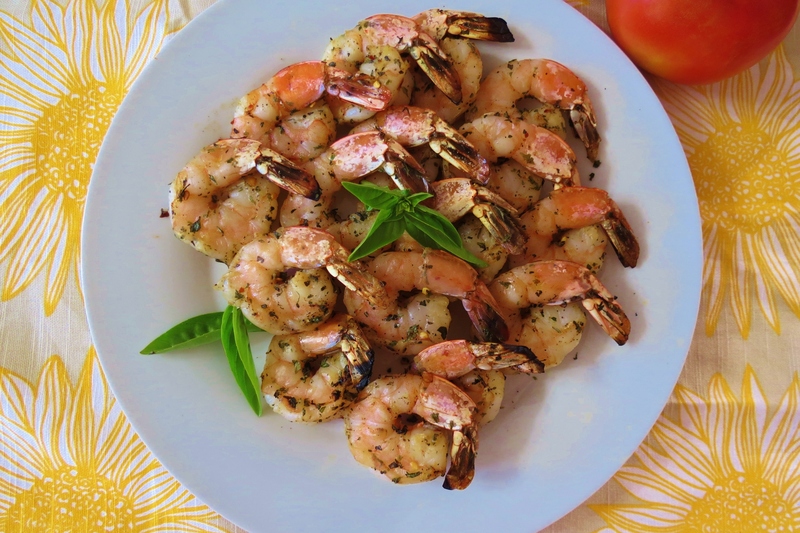 I was originally going to make Cajun Shrimp, but I decided on using Italian seasoning instead, because I was serving these with yesterday’s zucchini pizza’s. They were perfect together. Along with the shrimp and zucchini I also served it with some garlic bread cooked on the grill. This dinner was so easy to make. The whole thing took about 5 minutes to cook and about 7 or so minutes to prepare and I’m including the zucchini in this time estimate. This is such a flavorful and quick meal that is sure to please the family. My Husband loved it! I ate 4 oz of shrimp and he at the rest! Oh, and I made a pound of shrimp. He sat there reading his car magazine as he piled in the shrimp. Glad he liked it!! The seasoning I used is pretty simple. I used the spices that I had on hand. The shrimp turned out perfect. They had a slight little kick from the dried red pepper flakes. You know I have to put peppers wherever I see fit!! I like to use the uncooked Wild Blue Shrimp that I got at Trader Joe’s. I really like using uncooked shrimp better than cooked because it’s easier for me to tell when the shrimp is done, that way I don’t over cook it. Nothing worse than over done shrimp! I also didn’t marinate the shrimp I just used a little bit of olive oil and the seasoning. Thread onto a skewer, place on grill in about 5 minutes it’s done! 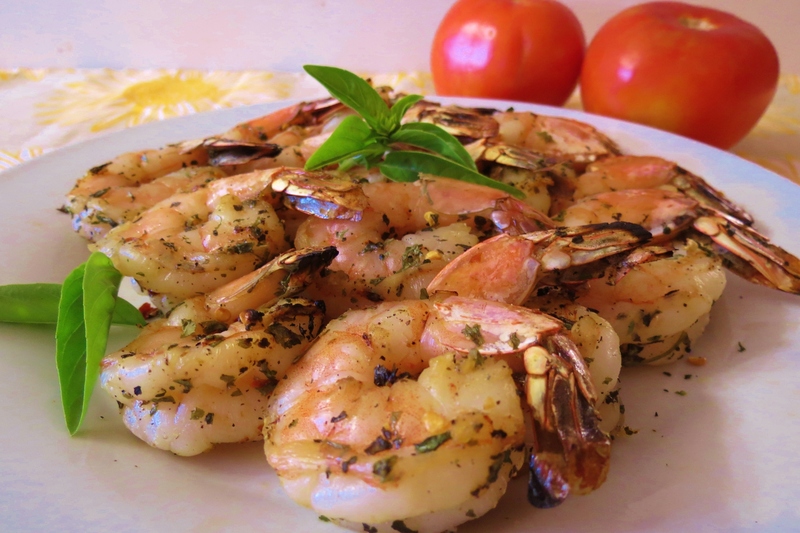 A quick and easy grilled shrimp, seasoned with basil, oregano, red peppers and more. Perfect for summertime grilling. In a small bowl add the Italian Seasoning Rub. Place shrimp in a ziplock bag; add olive oil. 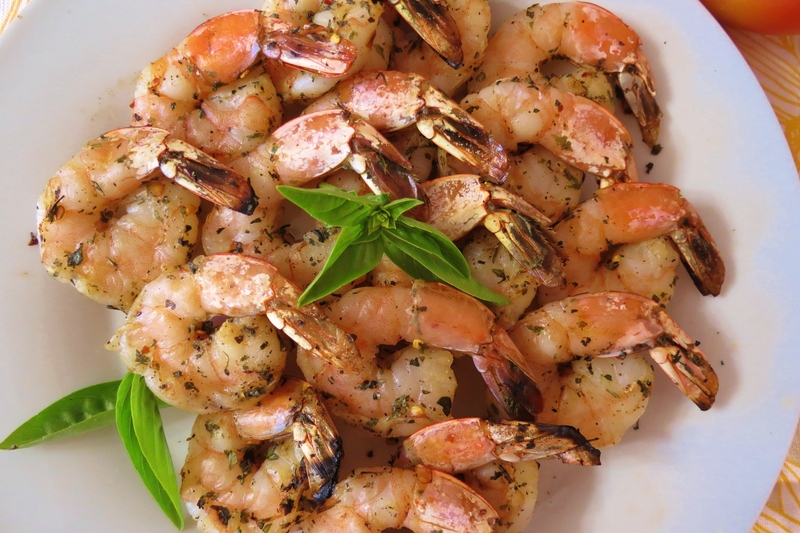 Make sure all of the shrimp is lightly coated with the olive oil. Add the Italian Rub to the ziplock bag and make sure all of the shrimp is coated. 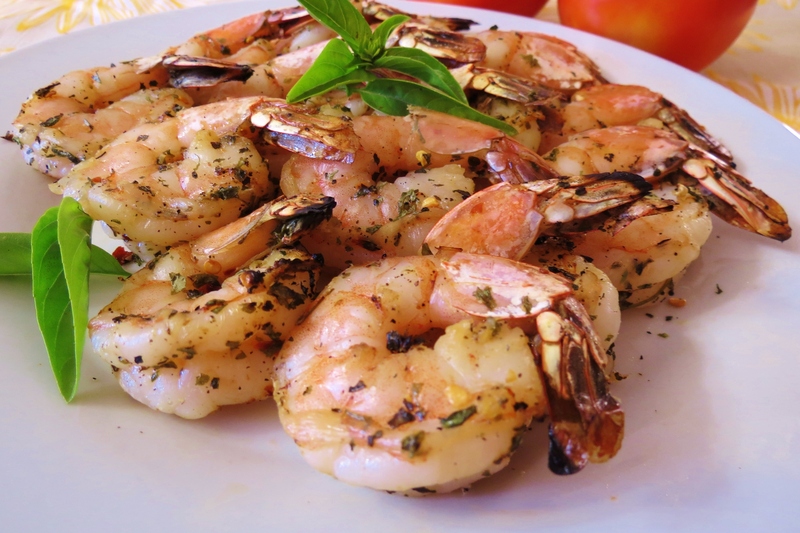 Skew the shrimp on a metal skewer or a wooden skewer that has soaked in water for 30 minutes. 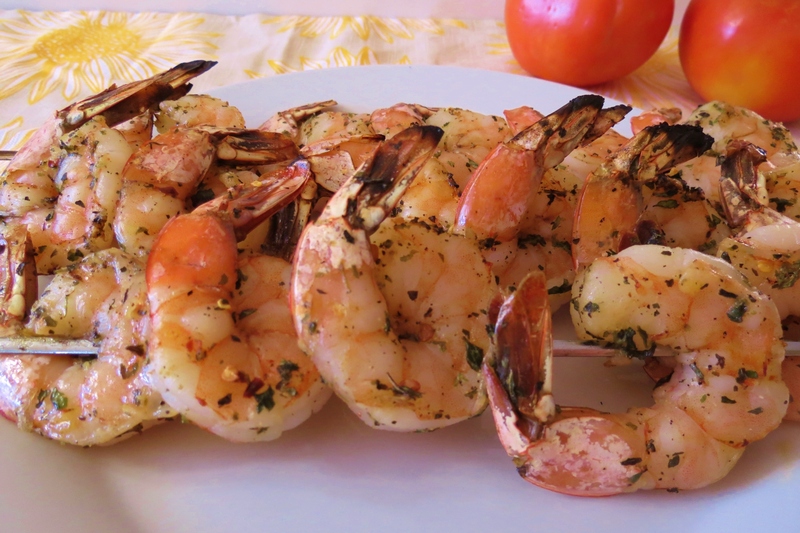 Place shrimp on grill, cook for 2 minutes per side. Cook until shrimp turns pink. Well time for me to make another dinner! Hmmm, I’m debating between burgers or something with veggies. Decisions, decisions. I made a goal this week, not to buy any groceries except for some odds and ends, that way I can use up what I have on hand, so my food doesn’t go to waste and maybe I can clean out the freezer? This looks so good! Unfortunately I’m allergic to shellfish. Do you think I could use the same rub on a piece of tilapia or swordfish? I don’t see why not! The rub is perfect with a lot of things, like pizza, spaghetti sauce, in an oil & vingear mixture, chicken and fish!! Gove a try, I think you’ll be pleased! This looks so good! It’d go wonderfully with some bow-tie high fiber pasta tossed in. I’m excited to hear what you think about that workout video! I am definitely more of a cardio person but I’ve got to get that strength training in somehow! I can see why your husband had a hard time waiting for dinner – it looks wonderful, the perfect summer dinner! OMG HOW GOOD DOES THIS LOOK? I love shrimp anything and these kabobs look exceptionally delicious!